F&M’s Elkton, VA bank sits on Business Rt. 33 across from McDonald’s. You’ll see a brick building with black shutters and front stone columns supporting an overhang to provide protection from the elements. Our parking lot is bordered by a tree-lined green lawn and offers plenty of spots to choose from. Did you know that the town of Elkton was officially incorporated in 1908, the same year that F&M Bank was founded? We are proud of our long history serving the people and communities of Rockingham County. As a community bank, we understand the importance of contributing to the vibrant towns where our customers and employees live and work. Giving back is part of our culture at F&M, through regular events like Casual Fridays for Charity and special occasions such as the Harrisonburg-Rockingham United Way Day of Caring. Our connection to local communities extends to our employees’ regional knowledge and expertise. When you come to F&M for a loan or other financial product, you can trust that all our decisions are made swiftly and locally. Although we are smaller, we offer the same convenient choices and cutting-edge technology as the national banks. We also offer perks most big banks don’t, like ATM fee refunds, high interest checking, and debit card cash back. F&M Bank Corp., our parent company, has ranked 4th out of 13 Virginia banks on the American Banker’s top 200 list of publicly traded community banks. 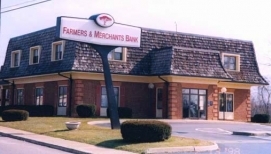 If you’re looking for banks in Elkton, VA, visit F&M to discover the flexible and professional service that only a community bank can provide. Call us or visit the Elkton branch today to discuss your financial needs and goals with our friendly and experienced team.